If you are looking for a more affordable outdoor marketing solution compared to a full vehicle wrap, custom vinyl vehicle lettering is a great way to get the word out. With over 900,000 impressions per month, your vehicle could be creating some serious bumper-to-bumper marketing action. 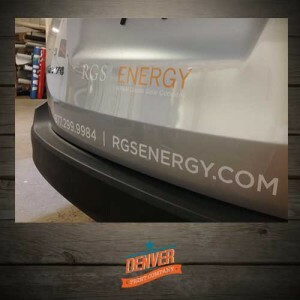 Whether you have a single company vehicle or manage a fleet, Denver Print Company can show you some of our fast and easy custom lettering solutions. Displaying pertinent business contact information on the back or sides of your vehicle is affordable and it’s easy to include things like your web address, contact name, phone numbers, address and email. QR codes are also a great way to capture user information immediately by sending potential customers to your capture page or social media site. Take your message to the streets with our full color and single color vinyl printing with professional cutting and installation services. Denver Print Company has provided vinyl graphics for the City of Denver, RTD, Taste of Colorado, Yellow Cab, Fitness on the Rocks, Black Bear construction and hundreds of other local municipalities and businesses. We are honored to have worked with so many businesses and would love the opportunity to help you grow your business as well. Denver Print Company will expertly print or cut your full color or single color vinyl project and professionally install the graphics to your car, truck, boat or any flat surface. With over 15 years of installation and training, our team can confidently apply vinyl to any flat surface. We understand that your marketing budget is one of the main concerns for any small businesses. We are proud to design simple vehicle graphics and lettering packages that will last for a few years and that are easy to install yourself, saving you money on expert installation costs.